Booked: McManus, Roberts. Sent-off: Roberts. Luton Town: Logan, Gnakpa, Davis, Worley, Spillane, Keane, Emanuel, Hall, Jarvis (Charles 81), Pugh, Martin. Subs not used: Brill, Roper, Asafu-Adjaye, Scott Sinclair. Chester City: Danby, Roberts, Linwood, Kelly, J.Vaughan, S.Vaughan, Hughes, Mozika (Barry 67), Lowe, Ellison (Taylor 60), McManus (Harris 90). Subs not used: Partridge, Rutherford. Chester remain unbeaten in September after an encouraging performance at Kenilworth Road saw them earn a deserved point against a side only propping up the league because of a harsh 30 point deduction. The contrast between City’s last game south of the Watford Gap couldn’t have been greater. It was actually hard to imagine it was the same core of a side that lost 6-0 at Dagenham just seven weeks previously. Kevin Ellison could have given the 212 travelling fans something to cheer about almost from the off when he was in a one-on-one with Luton ‘keeper Conrad Logan in the third minute. 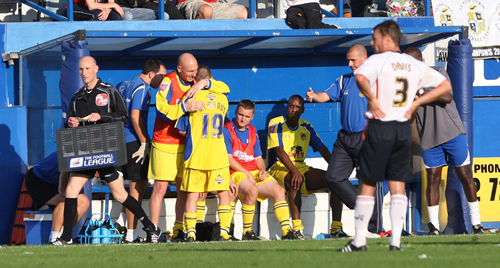 But Logan held onto the ball and Ellison seemed to suffer a knock in the process. Both teams started playing an open game of football and it was refreshing to see so many decent chances in the first half. Ellison and Ryan Lowe both had opportunities to put the Blues ahead. But Luton edged their way into the game, with their number two, Claude Gnakpa, putting in some powerful runs and great crosses. He went on to be named Hatters’ man-of-the-match and it was his determination that led to them scoring on the 41st minute. He powered down the wing and just went he looked to have over-run the ball, he laid on a great cross for Asa Hall to connect with and volley home. Gnakpa clattered straight into the advertising hoardings after his deft cross and took a while to recover while the Luton team were celebrating. I feared it was game over then, especially when Luton went close with a couple of shots early in the second half. But City seemed to slip into a higher gear when Ellison went off and was replaced by Paul Taylor on the 60th minute. It was the best performance I’ve seen Taylor give and although the Luton defenders were now towering over the vertically-challenged Chester strikeforce, it was still a finely balanced game. Anthony Barry came on for Damien Mozika, who had an unusually quiet game. Barry almost immediately made an impact, with a powerful shot on the edge of the area which seemed destined to hit the onion bag, but for the head of Luton central defender Keith Keane. The impact on Keane’s skull had some of the Chester fans wincing behind the goal, and he was deservedly thanked by the beaten Logan. Chester carried on pressing forward and Ryan Lowe stepped up to take a free kick after Paul McManus was fouled on the 75th minute. Luton’s defence were caught totally napping and both Taylor and McManus were left unmarked as the ball came across. It was McManus – surely the smallest player on the park – who headed for home and sent the Chester fans into wild celebrations. City were on a real high now and Luton were decidedly on the back foot for the next ten minutes. 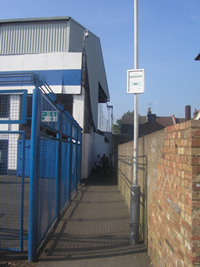 Kevin Roberts was sent off on the 88th minute for a second bookable offence after a reckless challenge on Hall, and Luton had a couple of strikes on goal as the game drew to a frenzied conclusion. But it was honours even, with City decidedly the happier of the two teams at full-time. The Blues came over to the away fans to share their delight at a point gained, with McManus the star of the show enjoying the handshakes and back-slapping. Let’s hope he has a few more similar moments to come in his City career. Chester City: Danby, J.Vaughan, Linwood, Roberts, Wilson, Mozika, S.Vaughan, Hughes, McManus (Partridge 90), Lowe (Taylor 90), Ellison. Subs not used: Barry, Harris, Rutherford. Shrewsbury Town: Daniels, Herd, Jackson, Coughlan (Langmead 36), Tierney, Thornton, Cansdell-Sherriff (Humphrey 69), McIntyre, Davies, Holt, Hibbert (Walker 81). Subs not used: Garner, Ashton. Everyone knew the name of the referee before this game. Mark Halsey had been supposedly demoted from the Premier League for having the temerity to send the England captain off the previous weekend. It was a case of out of the frying pan into the fire of a high noon local derby for Halsey who must be looking forward to returning to the quiet life of the top flight after this full-blooded encounter. Although there wasn’t a cloud in the sky Chester had to batten down the hatches and weather an early storm as Shrewsbury tore into them from the kick off. The mass hysteria of the visiting support contributed to Damien Mozika’s fourth booking of the season as he clashed with Grant Holt as a corner kick was about to be taken. it seemed to be six-of-one-and-half-a-dozen-of-the-other but the wily Holt kept his head down. Holt had used his head to good effect in the first minute when Davies sent a free kick over but his diving effort was just wide of the upright. 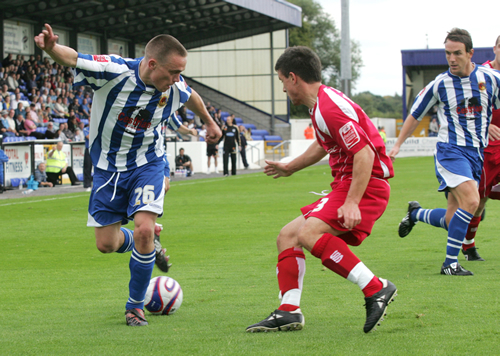 As in the Bury game, City began to play their way back into the game and gained a foothold in the match. They made most headway down the right and following a foul on Hughes, Ellison sent his free kick shot narrowly over. McIntyre was booked for a lunge at James Vaughan as City mounted another attack down the right wing. On twenty-six minutes all City’s good work was undone when they conceded yet another penalty. The danger from the Shrews’ attack seemd to have been cleared but Stephen Vaughan flew into the tackle on Ben Davies and Mark Halsey pointed to the spot. A brief glimpse of a reprieve was offered when Danby eventually persuaded Mr Halsey to consult the linesman who had flagged that the ball had already gone out of play but hopes were dashed when the penalty was taken and Holt scored. If anything, this setback was the grit in the oyster for City who produced a pearl of fightback against physically strong opponents. Their efforts were rewarded when Davies fouled Ellison and the free kick was quickly taken. Stephen Vaughan released Lowe down the right whose cross was deftly flicked across goal by McManus and into the far corner of the net. It was Chester who left the field at half time to a standing ovation. The visitors were, by now, far more subdued. In the second half City gave as much as they got and might have taken all three points when McManus’ impish skill in the box set up a shooting chance. His effort was blocked and Ellison put the rebound narrowly wide. Shrewsbury gave Chester a scare when they hit the woodwork twice in a couple of minutes. First substitute Humphrey, lurking on the right, shot against the far post. 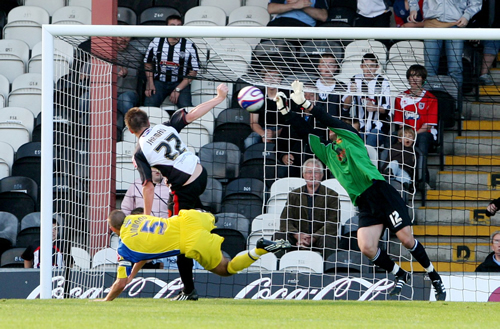 Then Hibbert was sent through after a fortunate ricochet from Hughes’ shot. The Shrews’ forward muscled past Linwood but saw his own shot crash against the angle of post and bar. City were warmly applauded off at the end of a cracking match. Hughes was rightly awarded man of the match but Roberts too had made crucial interventions in defence. More than achieving a creditable draw against ambitious opponents – it was the manner of City’s play as a unit which had encouraged the home support. Grimsby Town: Barnes, Bennett, Heywood, Newey, Vidal, Hegarty (Heslop 29), Hunt, Llewellyn (North 51), Till (Stockdale 86), Jarman, Boshell. Subs not used: Clarke, Montgomery. Chester City: Danby, J.Vaughan, Kelly, Linwood, Roberts, S.Vaughan, Mozika, Hughes, Partridge (McManus 75), Lowe (Barry 46), Ellison. Subs not used: Harris, , Rutherford, Williams. Referee: Mark Haywood (West Yorkshire). Kevin Ellison turned in a man-of-the-match performance to grab a stunning hat-trick as City returned from Blundell Park with all three points. With Laurence Wilson and Paul Taylor unfit Blues manager Simon Davies drafted in Richie Partridge and Shaun Kelly to the side that drew with Bury last Saturday. City got off to the best possible start with a goal inside the opening three minutes. Ryan Lowe sent Ellison free just over half-way, the winger outpaced Matthew Heywood on his way to the edge of the box before firing into the far corner past Philip Barnes in the home goal. Partridge had a chance to double the City advantage as he found himself in space from a Damien Mozika pass but he shot wide from the edge of the box. The lively Ryan Lowe tested Barnes with a 20-yarder but the ‘keeper was well positioned to save as City looked to extend their advantage. For the Mariners, who hadn’t won at home since March, the chances were few and far between. Tom Newy fired a free-kick straight into the City wall and striker Chris Llewellyn just failed to meet a teasing NIck Hegarty cross. The Blues conceded another free-kick in a dangerous position but James Hunt headed over. City were dominating and creating the better chances notably when Mark Hughes set up Lowe who cut inside the box before firing right across goal. The home side missed a great chance to draw level when substitute Simon Heslop shot wide from close range before John Danby was forced to palm over a Tom Newey effort from close range. Danby was called onto save from Ryan Till as the interval approached and James Vaughan was on hand to clear a Ryan Bennett header off the line as Chester kept their slender advantage at the break. Just as City enjoyed a great start to the first, it was the home side on top at the start of the second, and it took them just four minutes to draw level as substitute Danny North took advantage to turn and shoot past Danby as the City defence failed to clear a corner. City were on the back foot now for long periods as the home side gained control. Danby made a great save to deny Nathan Jarman whose header looked goalbound, and the ‘keeper was on hand again minutes later to deny Danny Boshell after fine build up play from North. Boshell missed another great chance, shooting wide when well placed, and the home side were made to pay for their missed chances when Chester struck again twelve minutes from time. A foul on Mozika gave City a free-kick 30 yards out and Ellison stepped up to send a screamer into the top corner in front of the band of travelling support. Danby was on hand to save from another corner eight minutes from time as Bennett sent in a goalbound header but three minutes later Ellison wrapped up the points to claim his first ever League treble. On the counter attack Mozika won the ball on halfway and sent substitute Paul McManus, on for the ineffective Partridge, down the line before receiving the ball back. The French midfielder ran through down the left and squared the ball back for Ellison to hit another stunning left footed strike into the top corner. The action wasn’t over though. Grimsby were awarded a penalty in the last minute as James Vaughan’s outstretched leg tripped Boshell on the edge of the box. The player took the spot-kick himself but screwed the ball wide of Danby’s right hand post. City went close again In stoppage time hitting the woodwork twice through Mark Hughes and McManus. Chester City: Danby, J.Vaughan, Linwood, Roberts, Wilson (Kelly 55), Mozika, S.Vaughan, Hughes, Taylor, Lowe, Ellison. Subs not used: Barry, Partridge, Harris, McManus. Bury: Brown, Scott, Futcher, Sodje, Buchanan, Bennett, Dawson, Barry-Murphy, Jones (Baker 90), Bishop, Morrell (Hurst 82). Subs not used: Belford, Cresswell, Racchi. Referee: Nigel Miller (County Durham). Bury came into the game on a high with three wins and a draw out of their first four games and third in the table – only goal difference keeping them off the top. Their confidence was obvious as they started the game much more positively than Chester. Gradually the home side began to claw their way back into the game and Ellison, Lowe and Taylor began to see more of the ball. Some of City’s approach play began to stir the home faithful and Taylor was proving to be a tricky ball player – one clever back-heel nearly made an opening in front of goal as the Bury defence found it heard to read him. Ellison had a looping header well wide of the target but was much closer with a half volley that had Wayne Brown saving at full stretch. The breakthough came when Ryan Lowe beat his man on the right and pulled the ball back for Mozika to slot home his first goal for City. It was to be expected that Bury would come back at City after the break but when they equalised shortly after it was the result of a soft penalty. A cross from the right was hit behind Morrell who turned and seemed to lose the ball but also fell over Linwood’s outstretched leg. The home fans clearly thought it was a dive but its difficult to be objective about it and the decision had to be accepted. Danby just failed to keep Bishop’s spot kick out. The goal seemed to knock the stuffing out of City for a while. Wilson had been injured in the build up and was replaced by Kelly who played in the centre while Roberts filled Wilson’s left back berth. City endured a torrid spell as Bishop misdirected a header when he might have scored and Morell swept a shot straight into Danby’s arms. James Vaughan then headed against his own crossbar – though the whistle had gone for a foul in the approach play. At the other end City began to rally. Taylor ran through but scuffed his shot well wide. But Chester’s best effort in the second half came when Stephen Vaughan hit a left footed pile driver towards the top corner of the goal which Brown just palmed over the bar into the top netting. As the game neared its close the play got increasingly niggly with Hughes and a couple of Bury players being shown the yellow card. A draw seemed a fair result in the end and an acceptable point following last week’s dramatic win against Barnet.